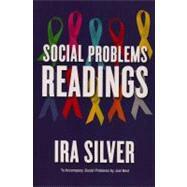 Social Problems: Readings offers readers a set of tools for analyzing any social problem. Silver's collection invites students to explore provocative questions concerning our society. Why do some social problems receive substantial attention while others receive comparatively little? How do claimsmakers bring attention to problems in particular ways that galvanize public awareness? How do certain claimsmakers use their power and influence to bring attention to certain problems while diverting attention away from others? What are the impacts of defining, and consequently treating, a problem in a particular way? After completing this book, readers will look at the social world in ways that they probably never have before. Book jacket. Ira Silver is Associate Professor of Sociology at Framingham State College. His areas of interest are social problems, inequality, organizations, and culture. He is the author of Unequal Partnerships: Beyond the Rhetoric of Philanthropic Collaboration, published by Routledge in 2006.